Rice is a staple food crop of 20 percent of the world's population. It's also grown on every continent except Antarctica. While it's an important part of our diets, new research shows that rice plants can be used in a different way, too: to clean runoff from farms before it gets into rivers, lakes, and streams. This idea came to Matt Moore, a USDA research ecologist, because he, himself, comes from a family of farmers. He was trying to figure out a way to address the unintended issue of runoff. As water drains from agricultural fields, the pesticides used on those fields can be carried along. Moore wanted to stop pesticides from getting into water outside the farm in a way that was easy and cost-efficient for farmers. 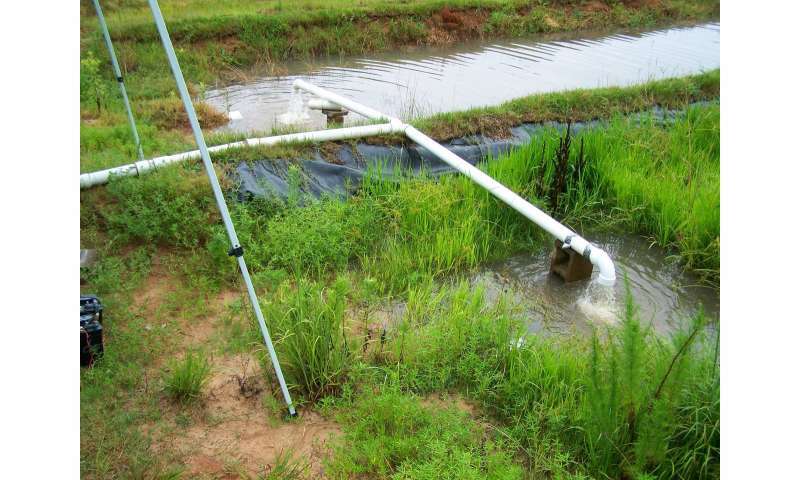 "We wanted something that was common, that could be applied in a lot of different places, but something that's non-invasive," said Moore, who works in the USDA-Agricultural Research Service's Water Ecology and Ecology Research Unit in Oxford, Mississippi. The idea came to Moore while he was driving to his family's farm in northeast Arkansas. "We're big rice farmers. Cheesy as it sounds, I was driving around trying to look for some inspiration and it just hit me: What about rice?" So researchers planted four fields, two with and two without rice. They then flooded those fields with a mix of three kinds of pesticides plus water that together is a lot like runoff during a storm. They did this for two years in a row. They found that the levels of all three pesticides were lower in fields where they'd planted rice. How much it dropped ranged from 85 percent to 97 percent, depending on which pesticide they measured. Rice can do this through phytoremediation—using plants and their roots to clean up water (though they can also clean soil and air). That's what researchers say happened here. 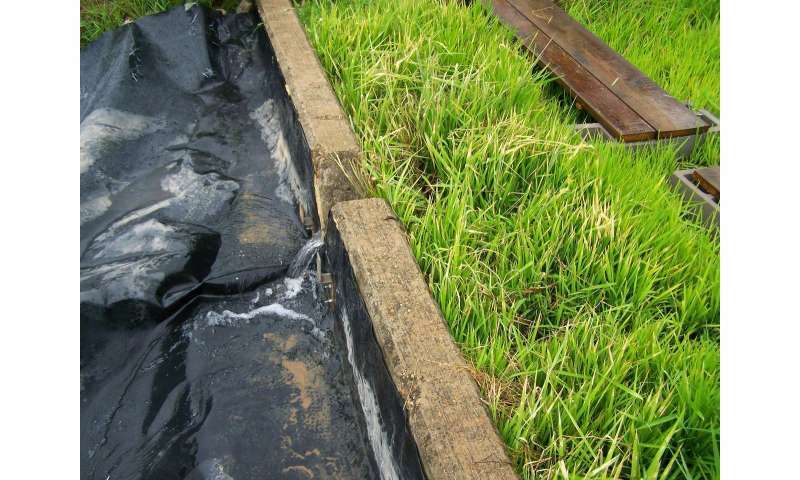 Instead of those chemicals being in the runoff water, they were captured in the rice plants. In real life, this pesticide-cleaning ability of rice could be used in a few ways. To start, farmers could plant rice in drainage ditches already on their farms, which would "let rice clean off water that runs off into your field before it runs into a river, lake, or stream," Moore said. "Dreaming big, eventually we could get to the point where you could use rice fields as constructed wetlands," diverting runoff into rice fields so they naturally take those pesticides out of the water. One big question Moore hopes additional research can answer is whether or not those chemicals end up in the edible part of the rice plant—the rice grain—itself. If it doesn't, rice could be that natural water cleaner while also being a food source. "It's potentially huge for developing countries to be able to use this as a crop and water cleaning technology," he said. For now, though, Moore is excited about the potential of a humble, popular crop that even his own family has been growing for generations. "We're just trying to use simple techniques that are easy for the farmer, that are economical, that are still environmentally friendly," he said. "Farming seems like a not-for-profit business these days, which I full-well understand. How can farmers use the landscape that's already there? How can they maximize that while helping the environment and their bottom line? Rice could be it."